My name is Dan, and I’m addicted to Euler (pronounced Oiler). Not really, but this site is fabulous: http://projecteuler.net/ The gist of it for non-math people is that it has a list of problems, for example, find the 10,001st prime number. When you think you have your answer, then you type it in the webpage, and it tells if you are right or wrong. Even more so, it keeps track of which problems you have solved, and puts a check next to them. 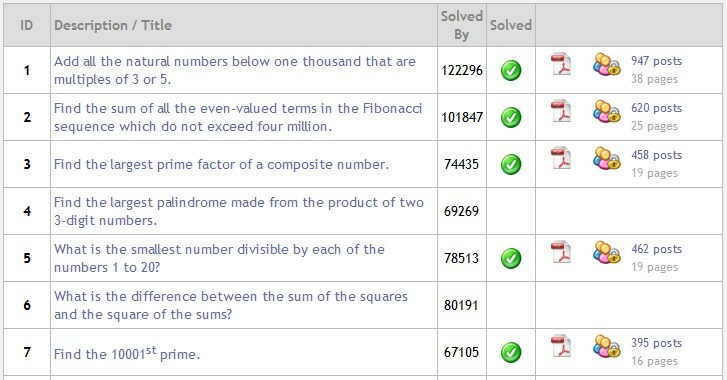 For those of us who have a brain that is ok at math and computer science, these problems are quite addictive. They are novel enough that you need to know some math, but they aren’t proofs either. “Brute force” methods (trying every number until you have an answer) have been my primary tool for these calculations. Thankfully I can use this in the Intro to Computer Programming class, so it isn’t entirely a waste of my time at school. Update: For those who want to learn python as a language to tackle project euler, a bunch of teachers from twitter will be using the following document: http://bit.ly/dZHl7s as a help center / Q and A. If you’d like edit access to ask your own questions, please email me. Likewise I’ve shared a dropbox folder with my current (hacked together) solutions in python, and if you’d like access, just email. Since beginning last night, I have solved 13 of them, slept too little, begun trying to figure out how to write code (can I enroll in your class? ), and cheated on one of the questions when a teacher I was working with today on a completely unrelated project wrote me a program. Thanks for the Q and A document. Apparently this Python you speak of resides in the Terminal of my mac. I already used it (not proficiently) to solve one of the questions. I need to get better. What happened to Basic? When I took computers in 1985, it was all about the Basic. Yea, very addictive. I’m up to 23 done, but I’m slowing down, don’t want to burn out. If you’re looking for a mac text editor that plays well with python, Text Wrangler works pretty good. Feel free to use Basic if you’d like; I’m sure it’d work!